An Illinois man who fled a sheriff’s deputy at speeds of up to 117 mph early Friday morning was charged in Rock County Court on Monday. 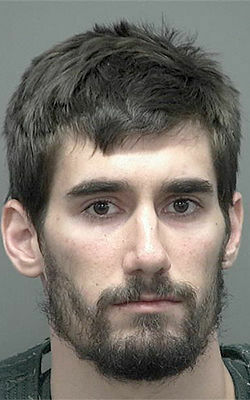 David E. Lepey, 22, of Hoffman Estates, was charged with fleeing an officer after an incident that started in Evansville and reached its top speed on Highway 14, according to the criminal complaint. Evansville police tried to stop a silver Lexus that was reported stolen in Illinois at 4:15 a.m. Friday, but the car escaped, according to the criminal complaint. A sheriff’s deputy spotted the car eastbound on Highway 14 and chased it for 5.2 miles before breaking off pursuit near Janesville, according to the complaint. The deputy estimated his own top speed at about 117 mph. Then around 5:10 a.m., a shoeless man who turned out to be Lepey was reported acting suspiciously at 100 Front St., Milton, according to the criminal complaint. In court Monday, Lepey was released on a signature bond after his father told the court he would get him into mental health treatment.